Last week, the gold price briefly rose above $1,300 per ounce, but then fell below $1280 an ounce. 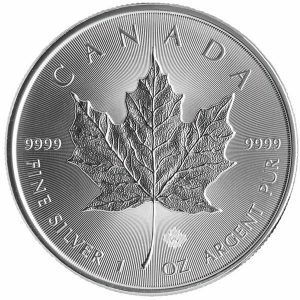 Despite the fall, over a 30-day period, the yellow-metal has steadily increased — rising from $1,222.30 per ounce on April 6 to $1,300.30 on May 3 — to $1,277.30 on May 4. The gold price has benefited greatly due to a weaker dollar. This is in part because the Federal Reserve has kept short-term interest rates on hold and has no plans to raise them in the weeks ahead. At its last meeting and as widely expected, the Federal Open Market Committee held its target federal funds rate at between 0.25 and 0.50 percent. Another rate hike is expected at the earliest at the June FOMC meeting, with the August meeting being a more likely candidate for a rate hike. Language in the FOMC statement was largely unchanged, with the exception of noting that economic growth has slowed, the labour market has improved, and household spending has moderated. Even though gold prices dipped slightly last week, they settled around 0.1 percent higher overall to continue a winning streak for the yellow metal. The price of spot gold closed out the week at $1,287.70 per ounce. 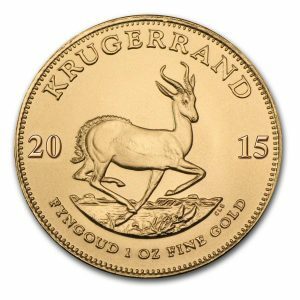 Gold was buoyed by a disappointing employment report released in the US last Friday. The latest data showed that 160,000 new jobs were added in April, well below the 205,000 jobs expected. The weak report supports the Fed’s recent decision to leave interest rates unchanged, and lowers expectations of a rate increase in the near future. For the first time in 15 months, the price of gold topped $1,300. So far, gold prices have gained over 21 percent in 2016. While some experts say the gold price won’t rise above $1,300 an ounce until next year, others claim it could go as high as $1,500 an ounce by mid-year. The centre of gold trading is slowly shifting from West to East. China’s Shanghai Gold Exchange launched a yuan denominated gold price fix on April 19th. As gold flows out of Western Vaults, it accumulates in Eastern vaults and homes. At some time in the future, Shanghai may challenge New York and London as the centres of trading activity for precious metals. For now, the new Shanghai gold fix gives China greater autonomy and solidifies China’s regional dominance in the gold trade. Even though China is the world’s largest gold producer as well as the world’s largest consumer, domestic production is not enough to meet the country’s own demand. Readers of, The Delaire Report, know well that for years, one of the problems regarding gold prices has been the problem of large scale manipulation in London and New York. But, as China’s influence increases, we may well see an end to this manipulation. Time and again, I have recommended owning both gold and silver. 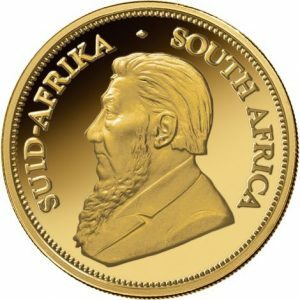 And, during the last 6 months or so, I have stated that in my view right now represents one of the best opportunities to begin investing in gold and particularly silver. My reasons are based on fundamentals and not whether or not the US Fed are going to increase rates. The key issues as far as I am concerned at the US dollar, the lack of global growth, central bank monetary policies, geopolitical developments and the decline in the oil price. The U.S. Dollar could be on the verge of a significant breakdown. The dollar has been under some notable pressure in recent months as investors and global markets try to figure out the path of interest rates going forward. While the Federal Reserve has put an end to its era of quantitative easing and zero interest rates, such policies could easily be reinstated. But, perhaps more importantly is the increasing loss of confidence in the US dollar by individuals as well as certain countries. Contrary to most reports by Western main stream media, many parts of the world continue to struggle economically. China, the world’s second-largest economy, is seeing its lowest growth rate in years. The European Union cannot seem to get its economy on track, and the economy of Japan remains stagnant. There are numerous geopolitical issues in play right now and an escalation of global tensions has the potential to cause a severe decline in global equity market and an increase in demand for safe-haven assets especially gold. These issues would seem to point to global deflation, a powerful force that can impact negatively on economies for years or even decades. Japan, for example, has been fighting deflation for almost 20 years and has thus far not been able to foster any meaningful economic growth. Central banks are experimenting with radical policies, like negative interest rates. Since the 2008 financial crisis, we have witnessed central banks introduce extremely reckless monetary policies. In an effort to stimulate their economies, they’ve borrowed and printed incredible sums of money. For example, the Federal Reserve has created 3.5 trillion new currency units since 2008. The Fed has also held interest rates at unnaturally low levels. The European Central Bank (ECB) recently cut its key interest rate to negative 0.4%. Imagine a bank that pays negative interest. Depositors are actually charged to keep their money in an account. Crazy as it seems, several of Europe’s central banks have cut key interest rates below zero and kept them there for more than a year. Now Japan is trying it, too. At the beginning of the year, the Bank of Japan surprised markets by adopting negative interest rates, more than a year and a half after the European Central Bank became the first major institution of its kind to venture below zero. By February, more than $7 trillion of government bonds worldwide offered yields below zero. That means investors buying bonds and holding to maturity won’t get all their money back. There is already a move away from the dollar underway, and other currencies, such as the Chinese Yuan, could potentially challenge the greenback’s status as the global reserve currency of choice. Needless to say, this could have a dramatic effect on the value of the dollar. Right now, the oil industry is in its worst downturn in three decades. The price of oil has plunged 75% since June 2014. In February, it hit its lowest level since 2003. After a big bounce in recent weeks, it trades at around $46 today. In 2015, America’s largest oil companies lost $67 billion, and at least 67 U.S. oil and gas companies went bankrupt last year. In February, accounting firm Deloitte warned that one-third of global oil companies could go bankrupt. U.S. oil companies borrowed almost $200 billion between 2010 and 2014. Today, debt payments are strangling oil companies of what little cash they have. That’s a huge problem for companies that borrowed too much. It’s also a big problem for banks that loaned oil companies too much money. Since the start of 2016 lenders have yanked $5.6 billion of credit from 36 oil and gas producers, a reduction of 12 percent, making this the most severe retreat since crude began tumbling in mid-2014. Gold is real money. It’s held its value for centuries because it’s durable, transportable, easily divisible, has intrinsic value, and is consistent around the world. Gold typically performs well when investors are nervous about the stock market, the economy and geopolitical tensions. And right now, there’s plenty to be nervous about. 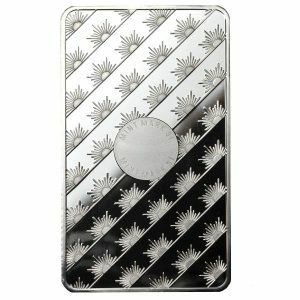 The price of silver has soared in recent weeks, hitting an 11-month high in April, considerably outperforming the gold price. ETF inflows – As mentioned above, the metal has seen strong ETF inflows—240 tons in the first two months of 2016 and 185 tons in February alone, according to Commerzbank. However, inflows slowed to just 60 tons in March. 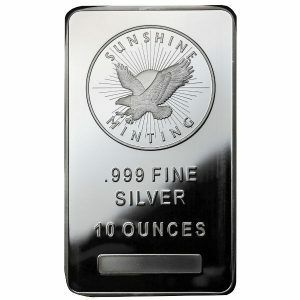 A boon for miners – To be sure, a higher silver price would be welcome for many long-suffering silver miners. 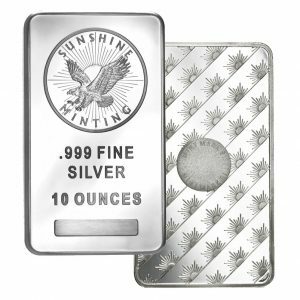 As Commerzbank notes, a low silver price per ounce has made primary silver production “hardly profitable at all.” However, that scenario changes at the current silver price, meaning more supply could come back online. 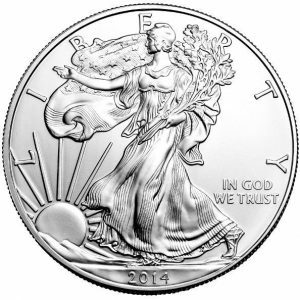 Higher demand – Of course, beyond its investment appeal, silver has a number of industrial applications as well. On this front, demand from the photovoltaic sector is expected to surge by 10 percent, driving industrial silver demand to its highest level in five years. Overall, while Commerzbank sees a potential correction for the silver price in the near term, the firm does see additional upside for silver in the medium to long term. 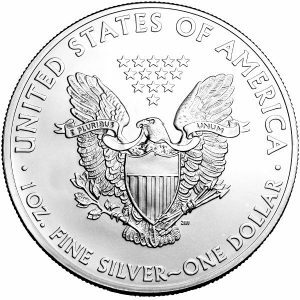 Commerzbank has upped its forecast for the price of silver per ounce to $18 from $17 previously. And, according the SRocco report, something big may happen to the silver market and the Chinese are preparing for it. 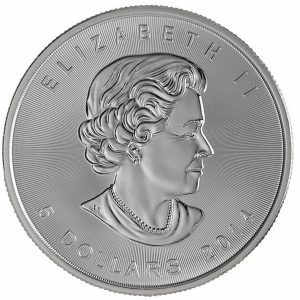 Silver is now trading at the $17 level, a price not seen in over a year. 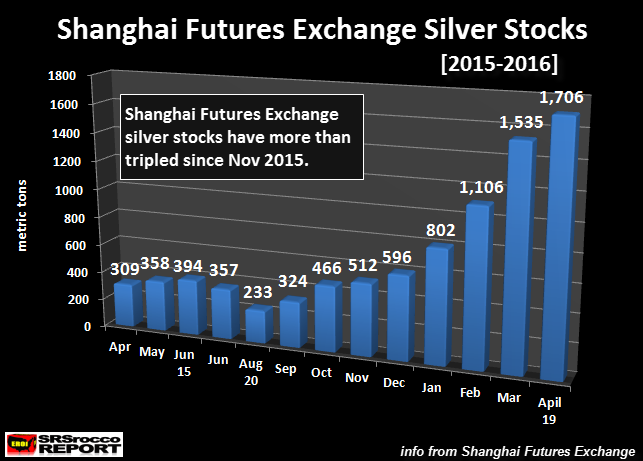 Shanghai Futures Exchange (SHFE) silver inventories bottomed on August 20th 2015 at 233 metric tons (mt), or 7.5 Moz. However, silver inventories at the SHFE began to really pick up in 2016 as they surged to 802 mt. in Jan from 596 mt. in December. This continued at a more rapid pace during the next few months reaching a staggering 1,706 mt today (54.7 Moz). Thus, silver inventories at the SHFE have more than tripled in less than six months. Why have the Shanghai Futures Exchange silver inventories jumped this much in such a short time? Do the Chinese know something we don’t?